For enjoying cooking as much as I do, I am not a woman of many appliances. I cringe at the idea of dusty appliances bursting out of the cupboards, to full to realize what I own in the first place. That being said, the one appliance I've been jonesing for has been a waffle iron, which I got from my friend, Shelley, as a wedding gift. I've been dreaming up all the fun stuff I would do with this waffle maker since June when I got the Amazon wedding registry notice that the gift was coming! The first thing I made was a Sunday morning breakfast of almond acorn squash waffles. Sweet and nutty on its own, the acorn squash played well with the crunchy almond bits. I'm gonna try not to freak out how much I love this new waffle maker! Split the acorn squash lengthwise, scrape out the sides. Place 1 teaspoon of butter and brown sugar inside each side and roast on baking sheet for about 30 minutes or until tender (I roasted the squash the night before). In a medium sized bowl, beat the egg, buttermilk, melted butter and vanilla together. Scrape the acorn squash into the mix and mash down with the back of a fork to combine. In another bowl, combine the dry ingredients. Combine the wet and dry ingredients, fold in almonds. Make waffles according to waffle maker instructions. I had mine with butter, maple syrup and sliced pears. Oh God, I have so many little gadgets hang in my pantries, unlike you and some of them I never use them. The waffles machine is one of these. 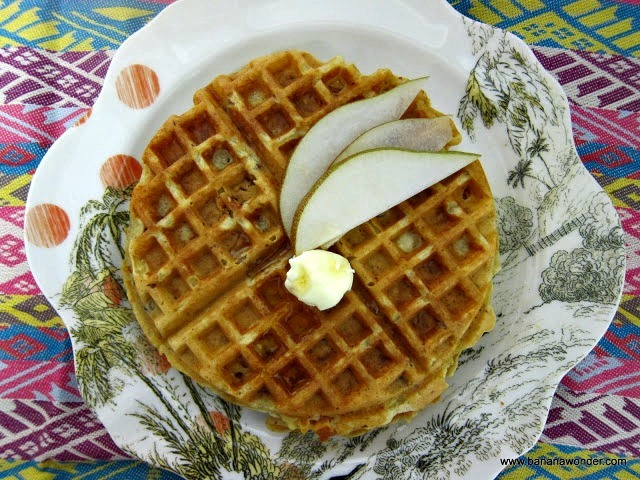 Your waffles make me wanna go and dig it out of the closet and make these almond acorn squash wafflew right away! These waffles look heavenly! Love your plate too. So funny. I hate having so many appliances but I've been thinking about meal combinations featuring savory waffles so I finally acquiesced and bought a small waffle maker. I loved your recipe featured here. Kat - Thanks for stopping by! I hope you make some waffles soon - I remember the best dessert waffles ever in Greece :-) Always served as a dessert and never breakfast! Angie - Thank you! Why not have some palm trees in winter in a non tropical location? Natassia - Oh, say what?!! I think this calls for a waffle muffin! Joan - Yes! Me too! I hope you make some savory waffles. I hope to get on this too. We'll have to share! Happy Holidays to you! I think I am going to have to get me one of these contraptions - what an awesome flavour combo! Good work!